This section will tell you more about SVCC and our rich heritage. 1773, The Vine presented to the people of Sevenoaks to play cricket on for ever by John Frederick Sackville, the 3rd Duke of Dorset. 1777, 18th June. Introduction of the third stump on The Vine. 1850, Pavilion is built, now listed. 1972, Winners Kent Premier League 1st XI. 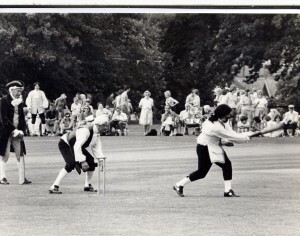 1973, July, SVCC and The Sevenoaks Hockey Club agree to a union that forms The Sevenoaks Vine Club. 1978, Winners Kent Premier League 1st XI. 1982, Orchard Field, Otford, acquired. 1984, 250* costume match celebrations. 1987, 6th December. Seven new oak trees are planted, making a total of eight. 1997, Winners Kent Premier League 1st XI. Finalists of Evening Standard Knockout Competition.